September | 2011 | IXA Ready - Fist On! 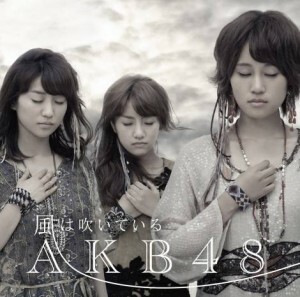 The 3 covers for AKB48’s next single have just been revealed and if you thought the girls would appear on them as they are in the PV for the song you’d be wrong. I actually think the covers look so much better than the PV. It’s a shame they couldn’t have looked like this in the PV. They look like they’re on a set of a fantasy type movie in their outfits. What do you think about the 3 covers? Will You Buy The Ultimate AKB48 DVD Boxset? 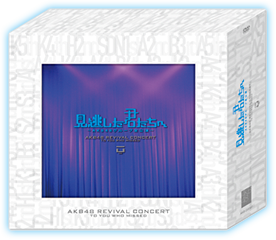 I’m sure by now you’ve heard about the ultimate AKB48 DVD boxset which is coming out on the 15th October. As you may remember, AKB48 held a number of concerts at the Tokyo Dome City Hall in which they performed past and current stages from 24th May to June 12th – this also included SKE48, SDN48 and NMB48. For those that couldn’t go to Japan and see these superb concerts, you now have a chance to buy them all on one massive DVD boxset which holds an incredible 23 DVD’s!! All of the concerts that took place will be on this boxset plus 4 making of DVDs, 19 bonus photos and a 42 page photobook. This does sound tempting doesn’t it until I reveal to you the price you have to pay for this phenomenal boxset – a whopping 34,800 yen (nearly close to the equivalent of $500 USD). Now whilst I might like to buy the whole shebang, I think I’ll pass thanks to the price. Perhaps if I manage to find it somewhere in Tokyo during my travels in November/December for maybe 25,000 yen I might dip in to my pockets to buy it. If you’re still not put off by the price tag of the boxset and plan to buy it then I salute you!! You’ll still be able to buy a smaller boxset (4 in total) which splits the concerts up and they’ll be priced at 9,980 yen each. The wait is over! 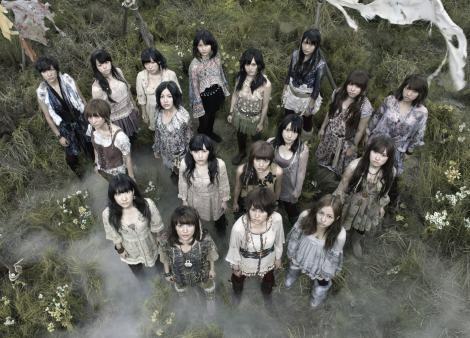 The dance version PV for AKB48’s 23rd single is finally out. I’ve listened to the song many times over the past 2 weeks and it’s really grown on me. The PV whilst simple and some might say dull is great. It’s supposed to be a serious song and that’s what you get in the PV – no smiles at all from the senbatsu. Here’s a sample picture of the one sheet B2 calendars that will be coming to the shops very soon. So many beautiful pictures! If it was difficult to choose a calendar before, it’s just become even harder now to decide which one(s) you want to buy! I’m not really sure where this has come from but female readers of a certain magazine have been voting for the Top 10 Most Hated Women Celebrities and unfortunately AKB48 appear on the list. A lot of the comments why women hate these celebrities is rather petty and reeks of jealousy such as “only works with hot guys” or “annoying and fake”. Erika Sawajiri can celebrate the fact that she’s no longer public enemy no.1 as she’s finally been pushed down the list. That honour has now gone to Masami Nagasawa whose hate brigade has slowly but surely been on the increase for the past 2 or 3 years. Morning Musume’s Sayumi is very close to the top. What these people don’t understand is Sayumi’s narcissist personality is only a character she plays and one she does rather well I might add. I can understand that many might find her ‘I’m always cute’ act a bit annoying. As for AKB48 on this list, a breakdown of which AKB48 member they don’t like would have been nice to see. I guess it was only a matter of time before we would get to see them on this list. Starting next month, SKE48 will follow AKB48 and NMB48 in finally getting their own weekly show on NTV. 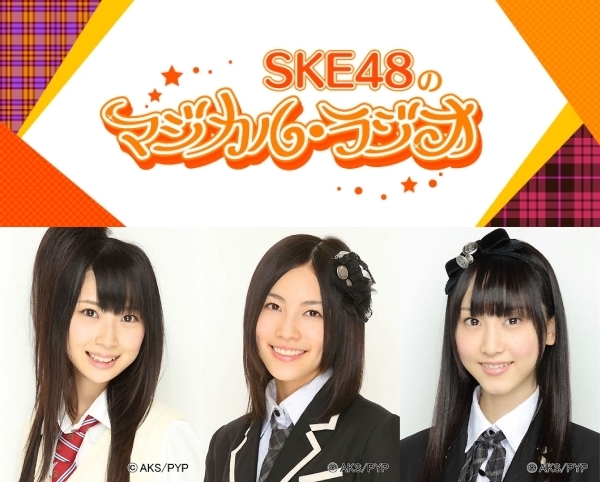 SKE48 no Magical Radio will mainly focus on Rena, Jurina and Akane Takayanagi and according to what I’ve read about the show it’s not going to be like any other idol variety show such as AKBingo or NMB48’s Naniwa Nadeshiko. It’ll be more akin to a drama than a normal variety show. I’m all game to see something a little bit different. The plot of the show as such is Akane hosting a radio show on a fictional radio station in Nagoya and being forced to host the show with Jurina who plays a former child actress in order to attract more listeners. 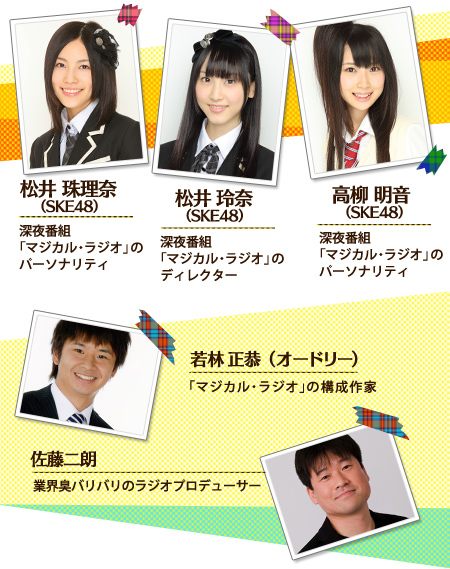 Rena’s role will be the director of the radio show. Being an SKE48 show, of course we’ll get to see other members of the group popping up as various characters on the show alongside Masayasu Wakabayashi from the comedy duo Audrey and actor Jiro Sato. What happens each week on the show is a bit of a mystery right now as there’s no real script. Everybody will be forced to ad-lib according to the situation that occurs each week. This show really does sound more and more interesting to me so I’m looking forward to checking it out. It all kicks off on Tuesday night October 11th at 1.59am. Going to Tokyo during the next 12 months and even better will you be celebrating your birthday in the city of your favorite idol group. Well your birthday could get better now because just announced and starting next month, AKB48 will be having special birthday shows in their theater each month……….and only fans celebrating their birthday during that month will be able to attend these shows and that includes us foreigners too. This is great for me as I’ll be celebrating my birthday in Tokyo in December so I want to know how to apply for these special shows and will there be any treats in store by the girls to you e.g perhaps pick a couple of people by lottery from the audience for a birthday 2-shot with your favorite idol or you get a piece of birthday cake from them? The translation on the web from Togasaki’s blog regarding this new development is rather crap so if anybody knows what you have to do to apply then give me a shout.